Swims gives us a first look at their latest innovation in the galoshes space to protect you (and your gorgeous shoes) from the rain and other messy, muddy places you wander through. 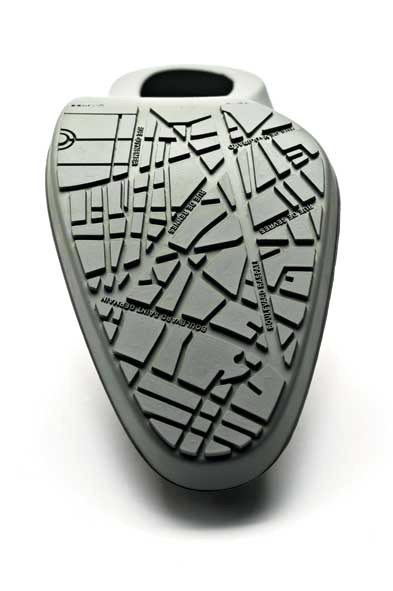 Here’s a peek at the new Swims City Slippers ~ the best detail is definitely the maps of NY, Paris, and Tokyo on the soles ~ although i do wonder if it means with every step in dirt, you can leave maps for the lost? It’s flexible design is ready for heels of any thickness (but your wedges will have to wait for now), and its low cut so no bows or buckles get caught. The price is $95, they will be available on the site any day now and in stores within two weeks. They will be available in burgundy, black, pearl, red, purple and olive. I must say, i feel silly writing about rain products while i’m sitting in this LA heatwave, a nice cool rain and breeze would be quite nice right about now! We’re big fans of the classic mens and women’s swims - as well as their push button open/close umbrellas after they saved both dan and i when running around NY for ICFF and into the woods of VT when only armed with dress shoes… so i can’t wait to try these out! See our past reviews/posts about swims here - and see more images of the new Swims City Slippers on the next page! UPDATE: check out Frizzi Frizzi’s post with a hands on look at a few other new Swims designs! What an amazing concept. I had something like this for the snow but it will really save a pair of suede or untreated leather. perfect for fall. and lets face it girlys anything that will protect your shoe won’t be as stylish. This is great and beautiful but it does get your feet wet. 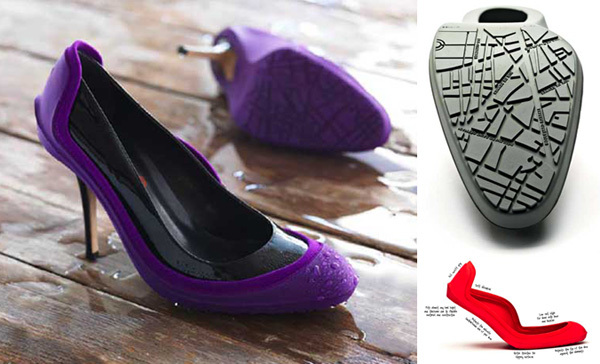 There’s another company that makes a “shoe Umbrella” for your stiletto’s… Shuella. I will buy them the first chance I get. There are many problems with these ‘galoshes’. First, galoshes are made to protect the feet from getting wet; these are laughable. They have to be one of the most ill conceived ideas that I’ve seen in a while. Second, except for the sole, which is somewhat creative, the exterior is hideous. 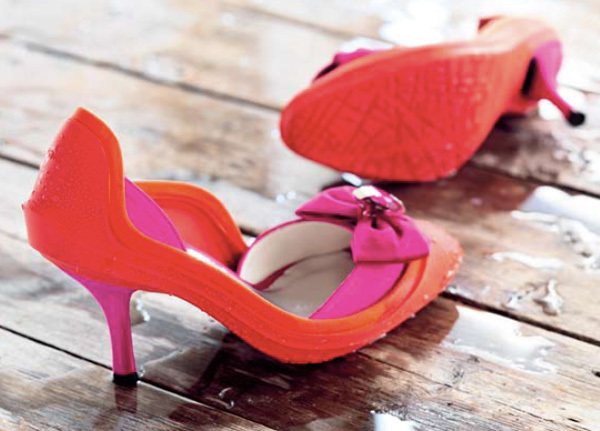 Take an elegant shoe and place three types of rubber over the sole; creating a bulky/heavy mess. Terrible. The solution. Create a pair of galoshes with the hole at the heal, but with the rubber extended past the ankles to mid calf. Neat! But why so expensive? LOVE THEM!! design meets function. im in the hunt for these. I think they add something to the shoe! The extra color actually looks nice in all those pictures, even if they don’t fully protect your shoes, it’s kind of like clothes for your shoes! 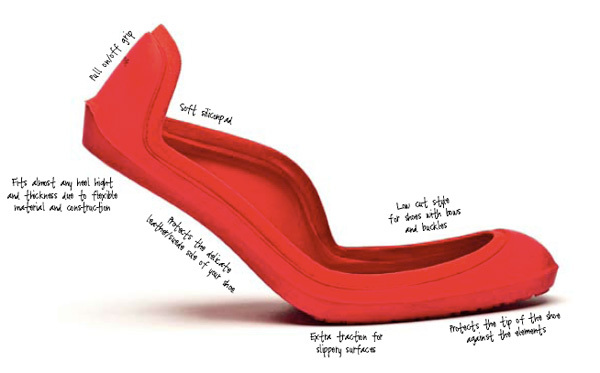 I like the concept, it’s really handy if you have a pair in your handbag…. But what is the point if your exposed feet gets wet by the rain/splashes of water/puddle anyway? It will still seep into the interior, like it would with unprotected heels, causing stained and probably stinky feet… IMO it would be more handy if resembled something like heeled boots - after all you don’t wear galoshes on a sunny day. I like the stronger sole grips though. quite amazing! Why didn’t i think of this wonderful idea??? i must get some!